Forums work when people participate - so don't be bashful! Click the "Post Response" button to add your entry to the forum--or start a new topic--or ask a question--or share your thoughts!! 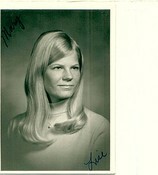 Sr. Mary of Jesus (Terri Harris) has been notified of Linda's death. Linda was always good about keeping in contact with sister. May Linda rest in peace. God bless. Linda was a good friend, so full of life and energy, always with a smile on her face. Yes, doing acts of kindness for everyone was a big part of who she was. She was there for me when my mom passed, bringing food and moral support. It's hard to be far away, I would certainly be there for Tom and the family right now. I believe her faith was strong, so am pretty sure she is in heaven now, smiling down on all of us. I have a thought I like to share when someone passes from this life. "When we think of those companions who traveled by our side down life's road, let us not say with sadness that they left us behind, but rather say with gratitude that they once were with us. Barb, this is a beautiful tribute to Linda. It was so beautifully stated. Linda's death was a real loss to us here on earth. But, Linda is an awesome addition for us in heaven. God bless you Barb. Corpus Christi 6th, 7th and 8th grade football team. We would have been in 7th grade the year this was taken. I did not play FB in 7th grade due to a knee problem. How many of these guys can you name? What a great pic, Rich! Wish my eyesight was better for the smallish faces, but it's fun to see. Weird that you guys were younger there, and many smaller than my nearly 6' 7th grader grandson is now. His basketball team has such a wide range of heights in the boys, that it does make me think of you guys way back when. Rich Halligan just a start. See if you agree with any on the FOOTBALL PICTURE!! Becky, I wish I could figure out how to make the photo larger on the post, but it's got me stumped. You might be able to download it from the website and use your computer to zoom in on the image. Steve, I got a feeling we are going to need your identification expertise. 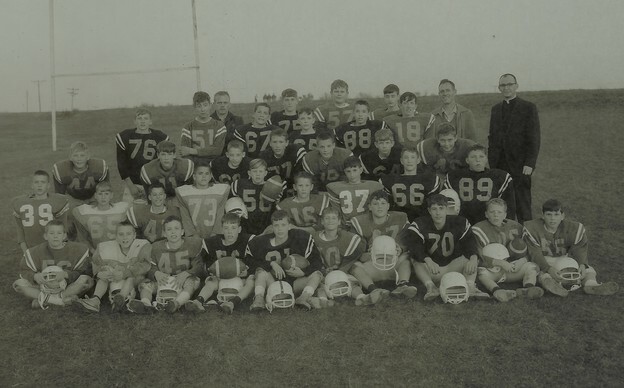 Jacquie, I think you're right on most of them, except #73 that's Chuck Halligan my little brother, he was a grade behind us. I think the kid with the football (in front of Pat and Mike) is Dan Mallinger (a grade ahead of us). Joni, I think you're right on all but #70, that is Mitch Hanrahan. A couple of others I think I can identify are: #89 Steve Smith(? ), #66 Tom Hickey (a grade ahead of us), #18 Tim Wafful (my cousin and a grade ahead of us), #51 is that Mark Kreiger? Corrections and additions are eagerly sought. That's well said Steve....still doesn't seem that long ago. I remember thinking soon after graduation that when we re-convened in ten years at our 10-year reunion, we would be 27 and 28 years old and that sounded SO OLD! Our 45th High School reunion is just about 5 weeks away. You should have received your invite with response form by now. Please fill the form out and return so we know how many will be coming. Early indications are that we will have a great number attending. On Friday, October 7th we will begin the fun filled weekend by attending the St. Ed's football game at Dodger Stadium. For those that haven't seen that stadium for awhile, it is refurbished and one of the best high school venues in the State! I hope to get a team class photo during halftime on the field that night if possible. On saturday there are a number of activities that have been planned which will culminate with a dinner and gathering at Old Bostons saturday evening. We look forward to seeing as many classmates as possible for what will be a great reunion weekend. Hello class of 1971! I have posted 70+ photos i have taken of our 45th reunion on a website for free downloads. Boother.... Thanks for the Bday wishes. So happy your arms were good enought to get you back to LaLa land. ps: give Beppo some shots of Patron to keep him calm! 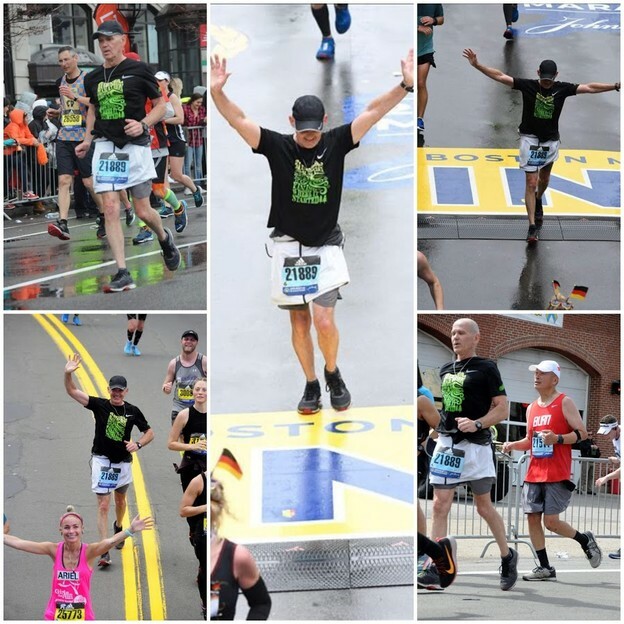 I was fortunate to have been invited to run in the 123rd Boston Marathon on April 15th, 2019. As someone once said--" I wasn't good in sports, so I ran, and I wasn't very good at running, so I ran long !" We're so proud of you Bob, you did it! !